Since their introduction into Britain in the 1870s grey squirrels have spread rapidly. They have displaced the red squirrel throughout most of England and Wales and in southeast and central Scotland. Grey squirrels can cause serious problems for foresters, native wildlife and gamekeepers. The bark stripping from tree trunks during the months of May and June, damages stands of timber and natural woodland. In spring, the taking of eggs and young chicks can be devastating for songbird and ground nesting bird populations. Damage to hoppers, feed bins and water pipes can cause serious and costly shoot management problems. Grey Squirrels are also a serious problem to homeowners taking up residence in loft spaces by chewing holes through sofit boxes and nesting. They also take over the garden bird tables driving away our songbirds from the nut feeders. The grey squirrel is also a significant factor in the decline of the native red squirrel population in the UK. Greys can carry the squirrel pox virus. And although they are relatively unaffected themselves the disease causes considerable suffering and death to the red squirrel – which is already severely threatened and extinct in many parts of the UK. 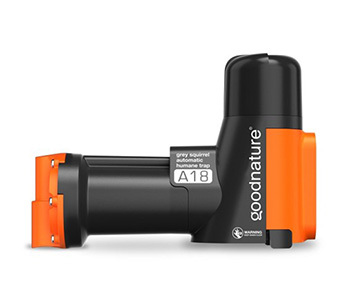 The A18 GS trap automatically dispatches 18 grey squirrels – one after the other, before you need to replace the gas canister. The trap comes with a tree mount which is easily attached to a tree, post, etc. Please note, the A18 GS Trap is only able to be used on, or after the 1st January 2019.